Earlier this week, UTSATailgaters broke the news that Adidas had been named the official sponsor of UTSA football. 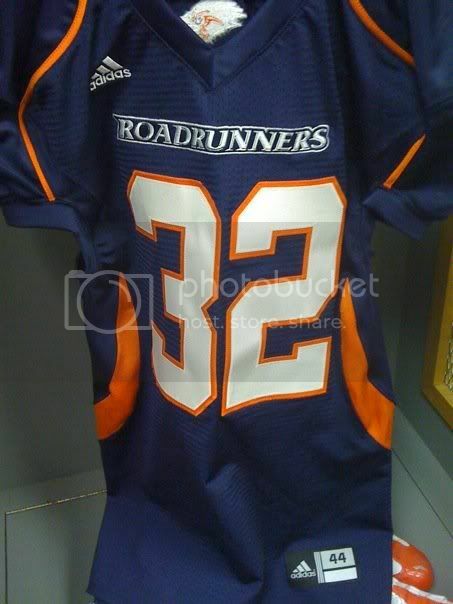 Over on Rowdyville.net, user RunnerDad posted this picture of what is believed to be the sample that Adidas submitted to UTSA for consideration. Chapel Hill RB/LB Lairamie Lee commits to Larry Coker and UTSA. We are unsure if he was offered a scholarship or if he will be joining the ‘Runners as a walk-on, so for now we’ll leave the commit count at 24. After visiting campus over the weekend, there are reports of possibly seven recruits committing to the Roadrunners, including highly touted LB Blake Terry out of Denton Guyer HS. LB & DB commit!!! More to come!!! Commit #21; Juco DB on board & more!!! #22 is a huge commit, literally!!! Also, a quick update on the progress of the site: I’m working on getting pages for each of the 2011 commits/recruits including those mentioned above, as well as getting the page for the 2010 commits back up in case anyone wants to take a look at some of our current players. I’ll also get the article database updated eventually, but there are hundreds of links that I need to add, so that might be on the back burner until National Signing Day when the recruiting news dies down.